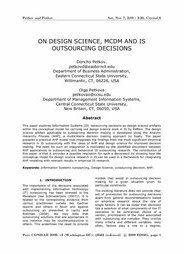 This paper explores Information Systems (IS) outsourcing decisions as design science artifacts within the conceptual model for carrying out design science work in IS by Peffers. The design science artifact applicable to outsourcing decision making is developed using the Analytic Hierarchy Process (AHP), a multicriteria decision making approach by Saaty. The paper presents a practical AHP model that integrates the findings from the most significant empirical research in IS outsourcing with the ideas of AHP and design science for improved decision making. The need for such an integration is motivated by the identified disconnect between AHP applications to outsourcing and behavioral IS outsourcing research. The contribution of this paper is that it provides a possible resolution for such a disconnect by showing how the conceptual model for design science research in IS can be used in a framework for integrating AHP modeling with relevant results in empirical IS research.